Nice day today. Not quite as hot. Looks like the rest of the week in Alabama will not be so hot either – no temperatures in the 90’s predicted for this week. Sweet! We spent the night at Jim’s last night which allowed us to continue our visit. This morning we went back to Veranda B&B for breakfast. Wow! It was so good and there was so many choices. The eggs were perfectly cooked – which is hard for a buffet. There was bacon and chicken, biscuits, fruit, french toast, peach cobbler, hash browns and more. 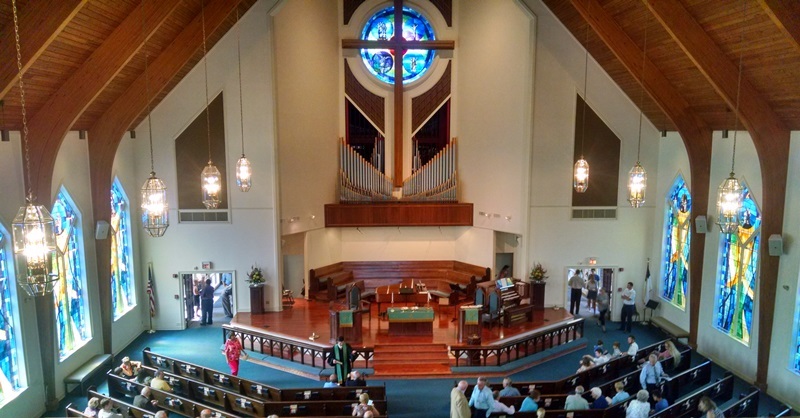 After that wonderful breakfast we took Jim and we met Anne’s cousin Nancy at Fayettville First UMC for worship. Then we went out for lunch. After that huge breakfast we didn’t need much, so we just had a salad. It was quite good too. After lunch it was time for goodbyes and we headed back to Alabama. It was an uneventful drive home – actually an easy drive. When we arrive we found the driveway badly washed. Fortunately, Barry and Donna who check on our house when we are gone had already warned us about this so we were sort of prepared. 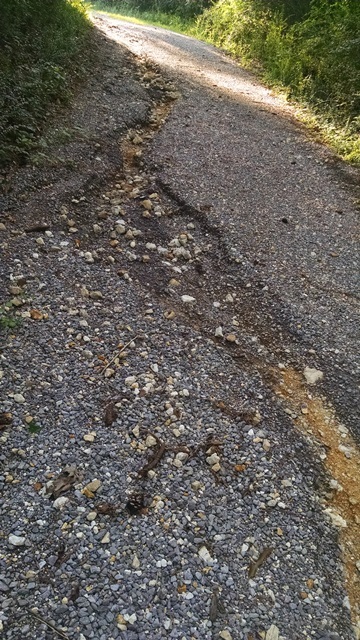 Lots of rain washed the drive and then made everything grow on the sides of the drive. Double whammy. We left FRED at Helen’s and drove to the house and got the tractor to scrape the drive and fill the areas that washed. While Max was on the tractor and Anne was cutting the bushes on the edge of the drive, Donna and Barry stopped by for a short visit. Sure was good to see them. 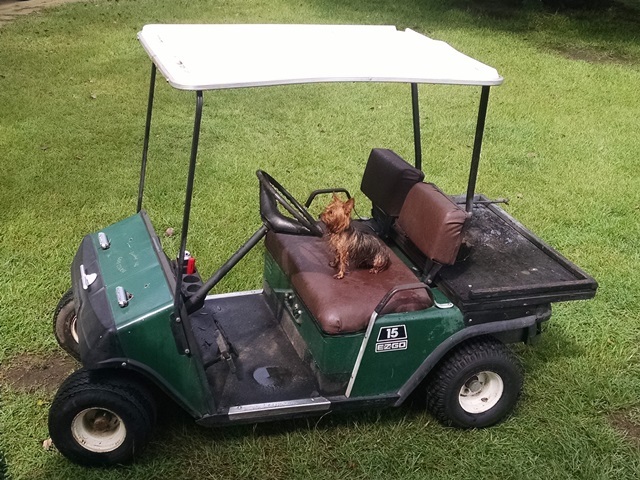 Oh well, got everything in pretty good shape and brought FRED on back to our house and started unloading. The rest will have to just wait until tomorrow. Hope everyone has a great week. Say a prayer for Max. He has some oral surgery scheduled for tomorrow. As everybody probably already knows, it was another hot day. At least in Atlanta it was hot and we had no showers or clouds. It did seem to cool off a little shortly before dark. The forecast is looking better for some cooler days to come. Sure hope they are right. 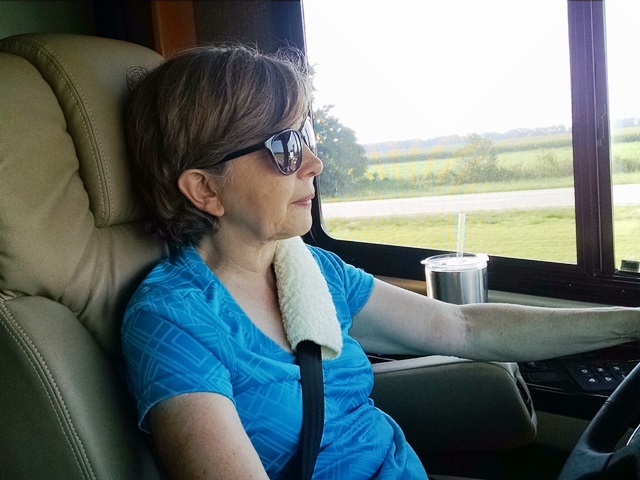 We left Randy and Debra’s house this morning in route to Senoia, Georgia where Anne’s brother, Jim, lives – about 4 hours. Anne’s sister-in-law, Marguerite, died June 4, 2017 after a long battle with ovarian cancer. Most of the family was together at that point in time but the Celebration of Life service was postponed until today because Anne’s nephew, Joseph is a Marine and was in Okinawa and could not be here until now. We arrived at Jim’s about 1:00 this afternoon and parked FRED in front of his house, but could only connect to a 20amp. 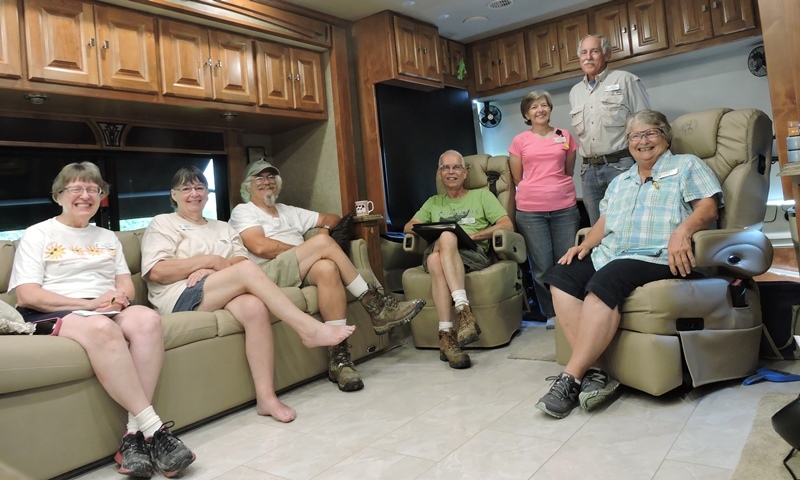 We could have run the generator, but since Jim has plenty of bedrooms we decided to stay in the house with him. 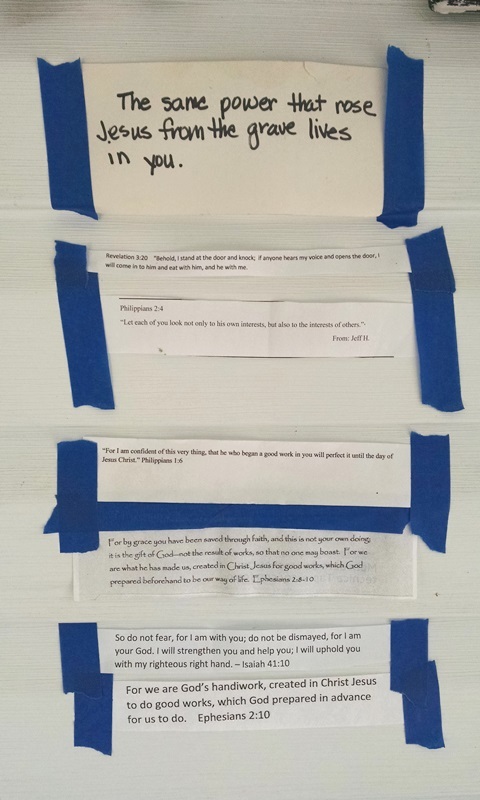 We didn’t think he really wanted to come home to an empty house after the service. 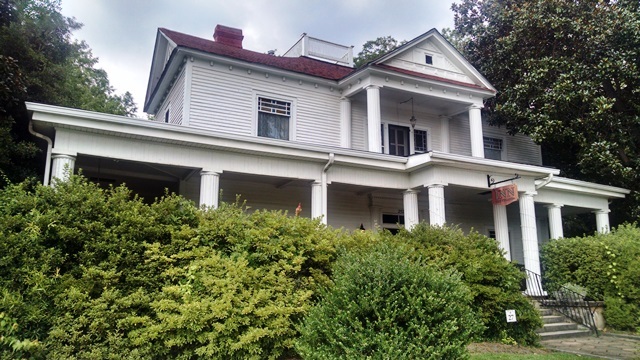 The service was held at the Veranda, a B&B in historical Senoia. The house was built in 1906 as the Holberg Hotel. There were lovely sitting rooms and a nice large room for the service and the meal that followed. It was a great time to be with family and close friends and offer support to each other as we shared our memories of Marguerite. It was a sad day in some ways, but a good day as well. 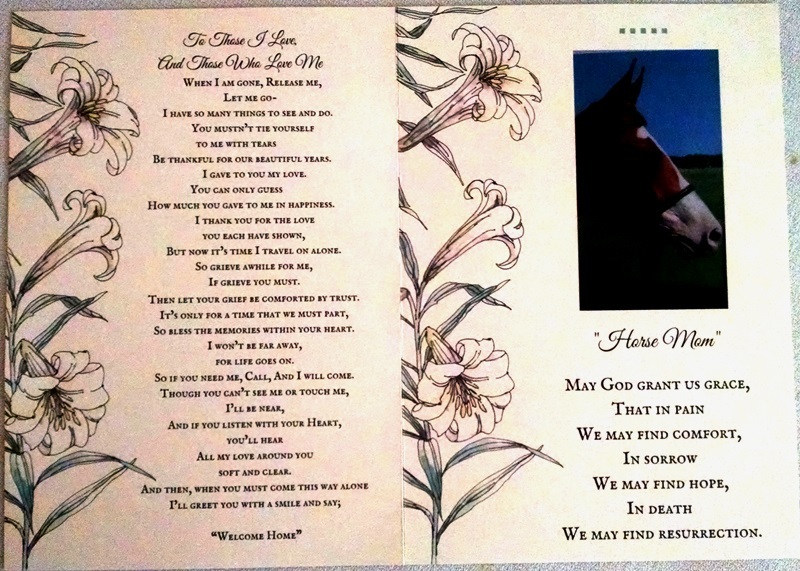 We all know that Marguerite is waiting for us to join her in heaven one day. Rest In Peace Marguerite. Please continue to pray for Jim as he works through his horrible grief and also pray that God will give us the wisdom and words needed to be there for him. A poem that Jim found on Marguerite’s phone. He doesn’t know where she found it. It was sunny and humid when we walked over to the dumpster about 7:00 this morning. 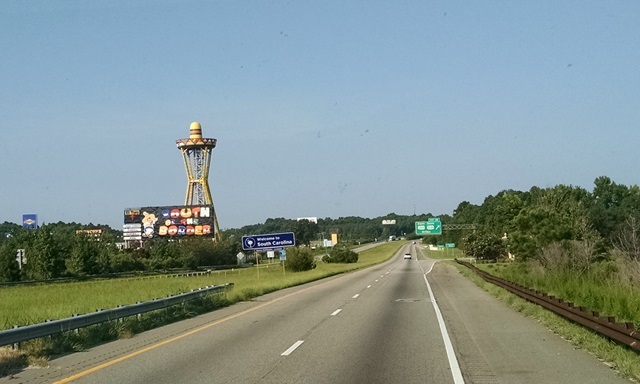 Today was a short travel day from Lumberton, NC to Johnston, SC where Max’s brother lives. We pulled out about 8:30 with Anne driving and then switched off at the rest area about half way. Then Max drove us through a lot of construction, with a stop for fuel and then on to Johnston. Nice uneventful drive. Everything worked as it was suppose and we had no problems. YEA! Debra and Randy were not yet home when we arrived but arrived shortly and we had a nice afternoon visit. 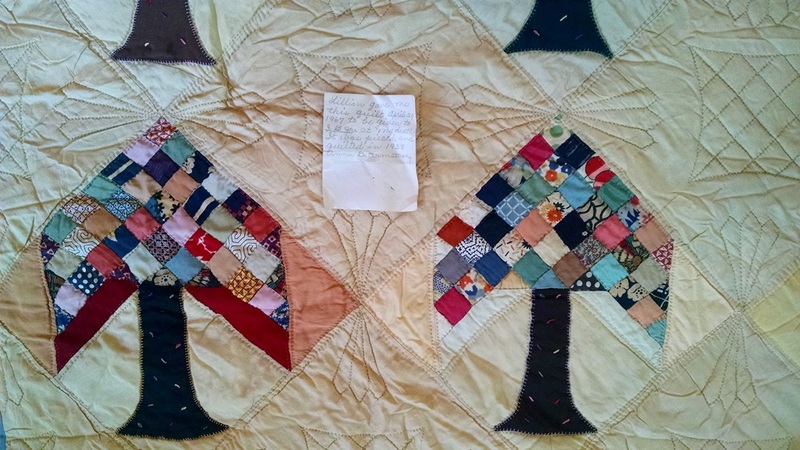 Debra showed us some old quilts that she found while helping Juno, Max’s Mom, prepare to move into Aunt Helen’s house. One was made in 1887 and is so amazing. Couldn’t help but think of Cathy and wish we had been able to show it to her. 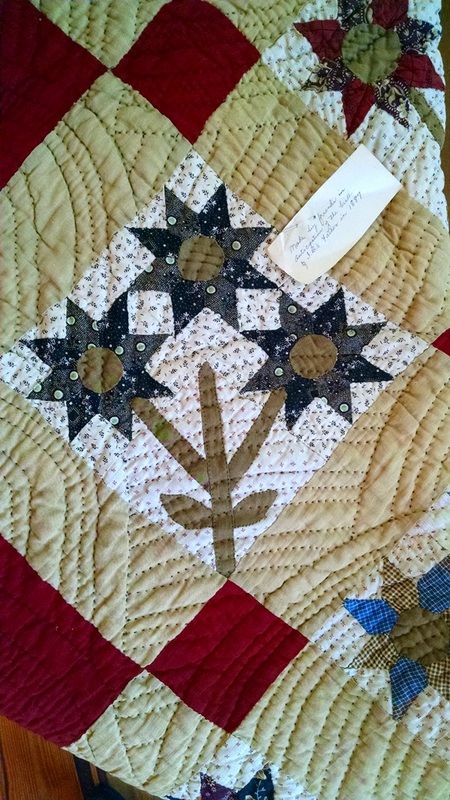 Hope you are enjoying the quilt show this weekend, Cathy. 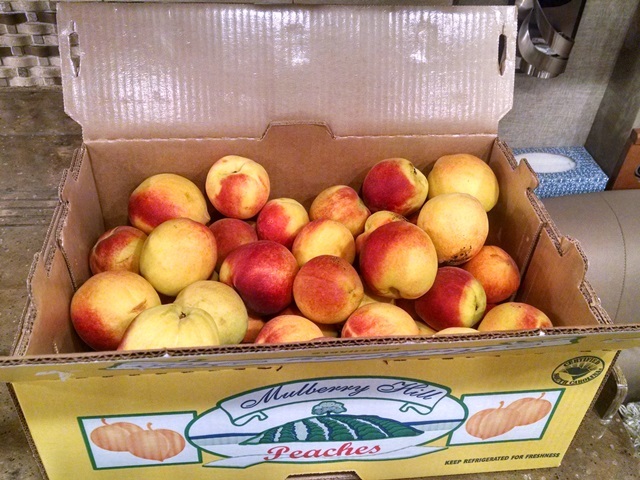 Since the peach crop is in full production here we went to one of the local packing houses and bought an $18 box of peaches. Then they took us to dinner at a great little restaurant, French Market Grill, where we enjoyed a wonderful dinner and even better conversation. We so enjoy the time we spend with Randy and Debra. We caught up on some family matters, and just enjoyed being together. After dinner Debra and Anne shopped for some new clothes for Aunt Helen. Neither of us are really confident in shopping for someone else, but together we do fairly well. Randy and Max shopped at Office Depot while we shopped for clothes. They bought Randy a new laptop. Congratulations, Randy. Hope you enjoy. (He is currently waiting for Windows 10 to update – this could take a while.) After making our purchases we stopped by Dave and Jennifer’s home. They had been painting this afternoon and wanted us to see what they had done. It was great to see Dave and Jennifer even though it was a short visit. Now we are sleepy and are going to bed. More tomorrow. Today started sunny and hot and only got hotter. Interestingly, all four weeks we have been in Lumberton, Thursday was the hottest day. That makes it a little hard because we are always the most tired on Thursday. Oh well, we all made it through and everyone stayed well hydrated. And even better we aren’t working tomorrow or Saturday when it will be even hotter. Suzanne had our devotion today which was based on Proverbs 19:21, Many are the plans in a person’s heart, but it is the Lord’s purpose that prevails. She shared a personal story of when was attempting to do something that was good, but at every point a barrier seemed to be up. She decided to abandon her plan and then found that God had a much better plan. We have probably all experienced something similar. Our plans really don’t matter – God’s always knows the big picture and His plan is perfect. It was then time to get to work. Today Anne, Max and Suzanne were at Mary Elizabeth’s house and Larry, Carol, Ray and Cathy were at Leon’s home. A lot of progress was made at both. The ceilings at Leon’s are ready to stipple. Unfortunately, Lowe’s did not have any stippling brushes. Jeff will try elsewhere. The walls had a little more work today and will need a little sanding Monday and then they are ready for a coat of primer. The cabinets were also installed at Leon’s today. 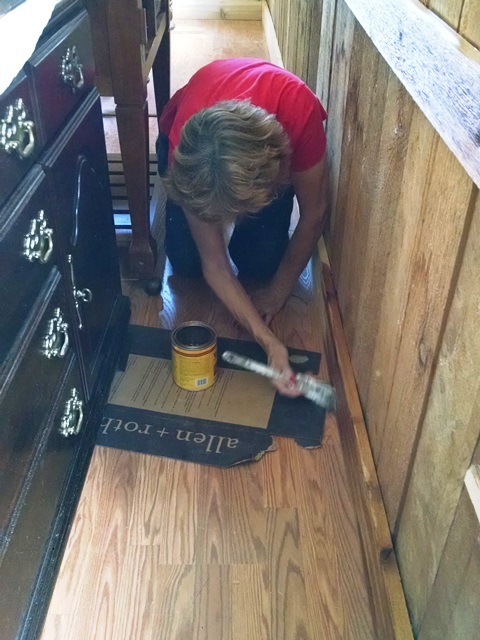 Today we finished the laminate at Mary Elizabeth’s. 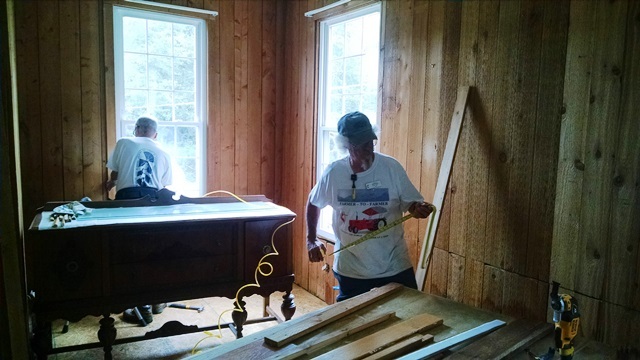 We finished the dining room – the cedar planks, the chair rail and base all done. We were all so excited. Her home is very close to be complete. There are some transition strips to be installed in some doorways, a little painting, a little base and quarter round in the kitchen and the kick plate under the cabinets. Otherwise the interior of the home is complete. 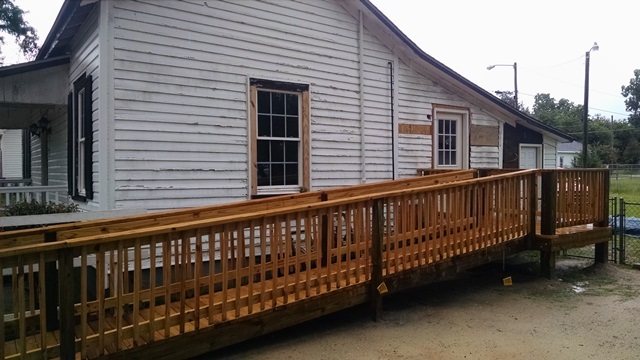 The porch, which will now become a sewing room, is yet to be done but the home is livable now. Mary Elizabeth and Elizabeth are so happy. 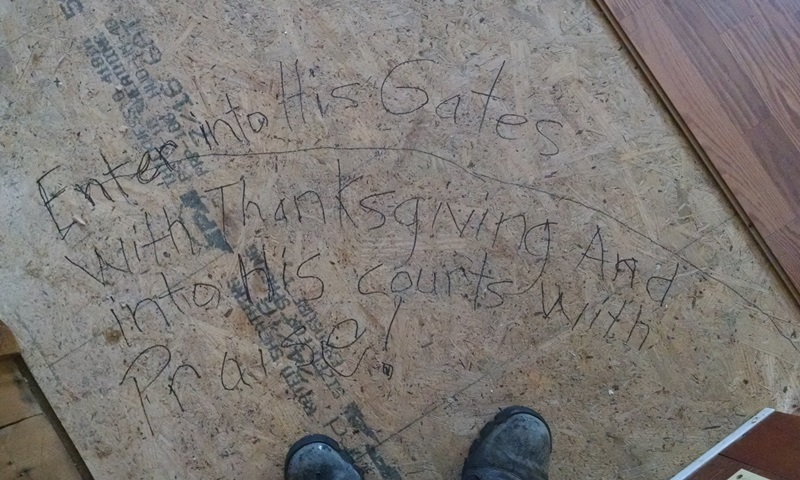 A sweet story – we were telling Mary Elizabeth about another house we are working on, and how we were trying to help an elderly couple get back into their home. 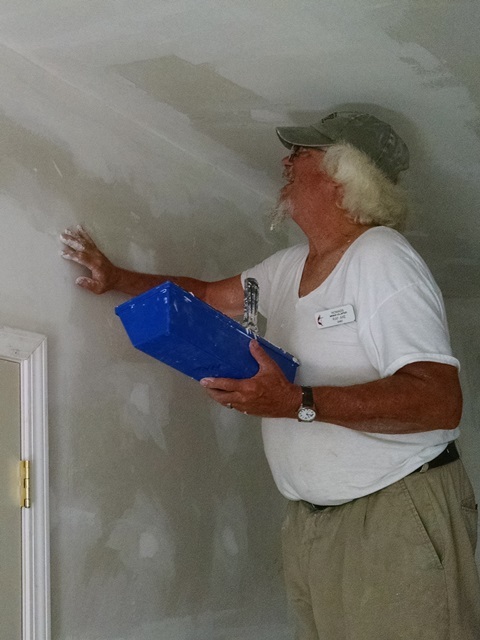 We said that we might be priming some of the walls next week. 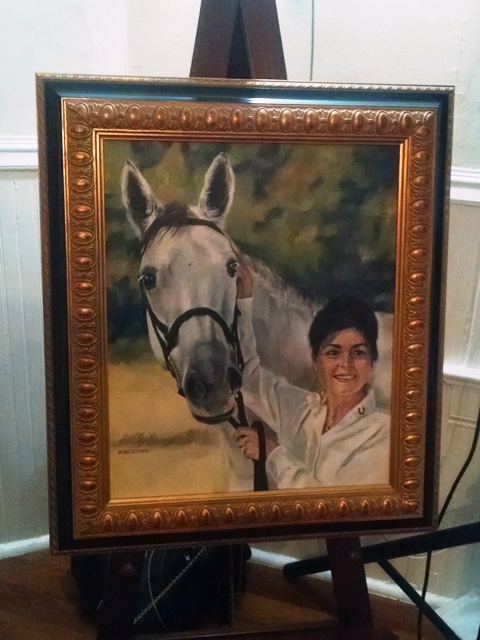 Mary Elizabeth asked if she might could help with the painting. “I’ve got my home back after thinking I had lost everything. I would really like to help someone else get back into their home.” How precious is that. We are sorry that we could not be here to see Mary Elizabeth’s home completed but we have truly enjoyed our time here and will treasure the friends we have made forever. After work, as is our custom when some one is departing the next day, we all went out to dinner. This time we choose Village Inn-seafood and barbeque. The food was good, but the company ever better. The entire team was present as well as Jeff, Jeff’s pastor and his brother. What a wonderful time we had. We found out today that Lumberton will be a drop-in site and so we hope to return here before the next project in the fall of 2018. Maybe we can return fall of this year. We shall see. Today was sunny and not as hot as some days, early. We actually had a low last night of 68. We’ll take it. This afternoon was hot but not nearly as hot as tomorrow through Monday will be. 98 predicted high each day with heat index to 110. Hope they are wrong. At least we won’t be working after tomorrow. 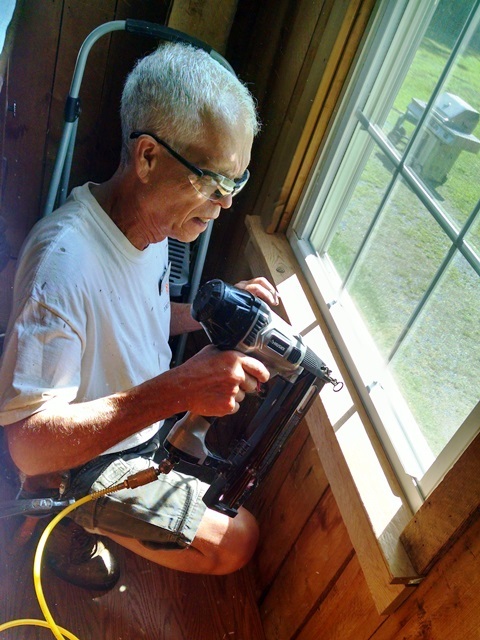 Roy and Cathy had devotion today and it was really fitting for a Disaster Rebuild project. After devotion we asked everyone to be flexible today since Jeff called early this morning with some changes in priorities. He needed us to go set a small cabinet in the kitchen of Dora’s house. 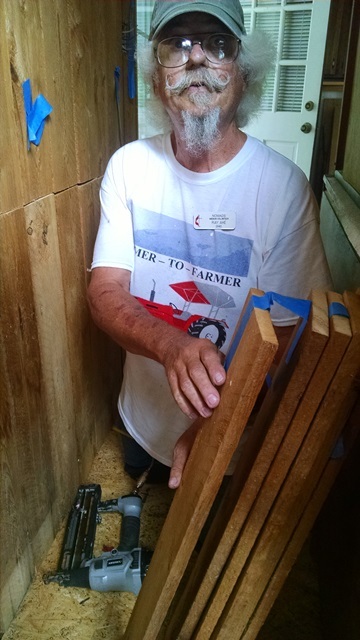 Jeff also had delivered the lumber for the chair rail and base for Mary Elizabeth’s so we needed to get that installed as well. We split the team again today between Mary Elizabeth’s and our new job for Leon and Virginia’s. Max, Carol Suzanne and Larry to Mary Elizabeth’s and Anne, Ray and Cathy to Leon and Virginia’s. 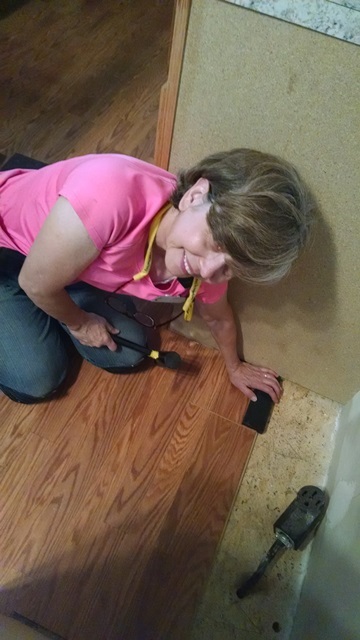 But first, Anne, Ray and Cathy went to Dora’s to install the cabinet. What should have been a quick easy install took longer than expected and we had to make a Lowe’s run for fasteners. 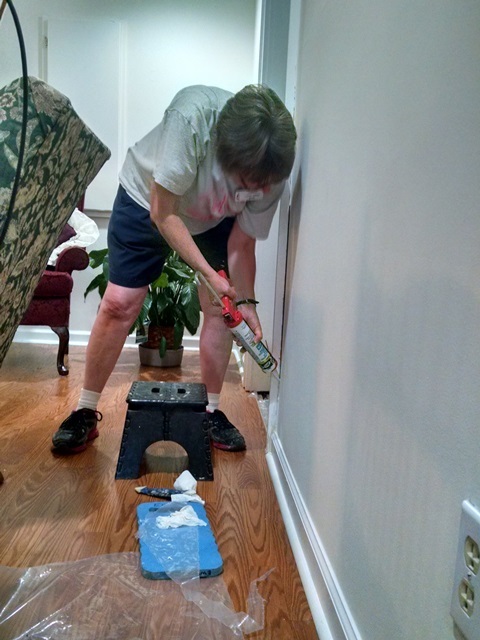 We also needed to make a small piece of chair rail to cover about a 2 inch spot. 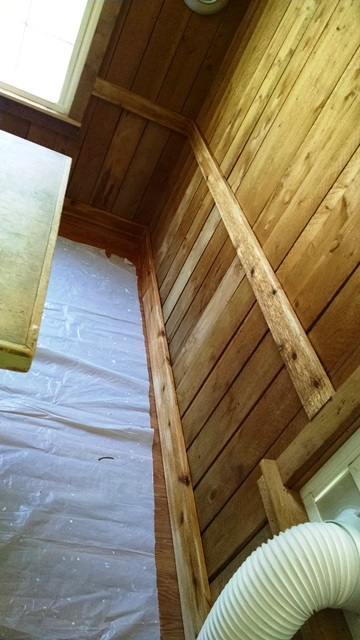 Anyway after completing that task we got started at Leon and Virginia’s again working on the drywall sanding and mudding. We ladies just love all the drywall dust in our hair. NOT!! 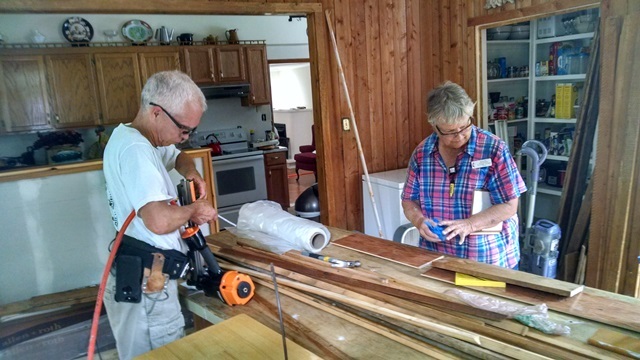 At Mary Elizabeth’s, Max, Carol and Suzanne made great progress on the laminate and Larry worked on the cedar trim installation in the dining room. After lunch Anne and Carol switched jobs. 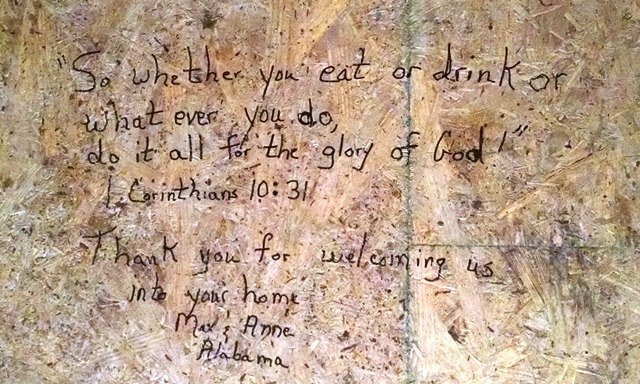 We wrote our thoughts and thanks on the floor in front of the kitchen sink today shortly before covering it with the laminate. 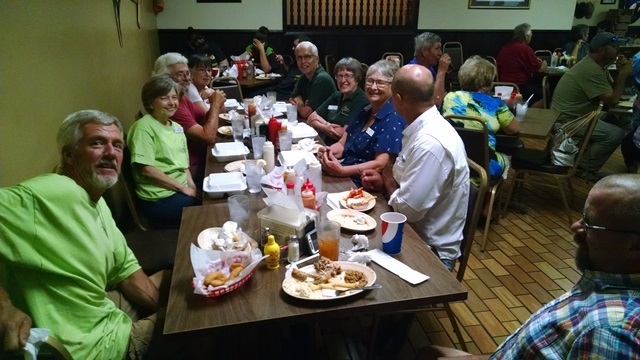 The folks working at Leon and Virginia’s came back to Mary Elizabeth’s to help us move heavy furniture shortly before finishing our day. 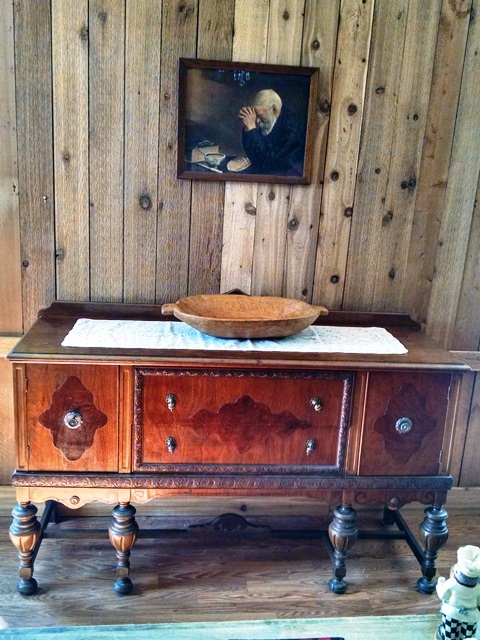 With the laminate complete in the dining room we moved the furniture back into place. 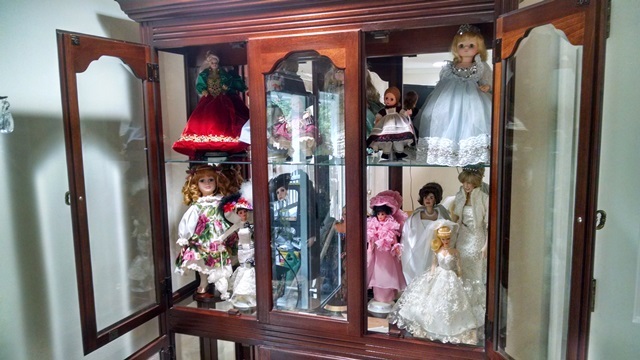 Mary Elizabeth was so excited to have her china cabinet back in place. She immediately started washing her china and putting it back into the cabinet. 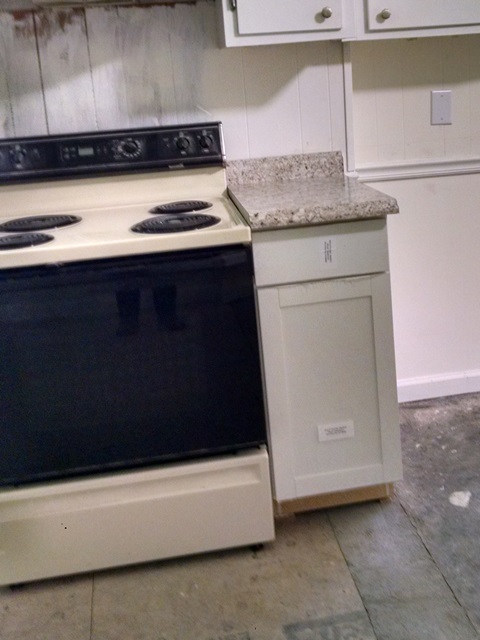 The kitchen is about half finished. Some of the rooms we are mudding and sanding are now ready for the ceiling stippling. Great team with lots of work being accomplished. One more day left for us, but the work will continue long after we are gone. The rain began about 4:00 this morning. Boy was it hard to get out of bed. Listening to the rain on the room and snuggling up in bed – we could have slept several more hours. 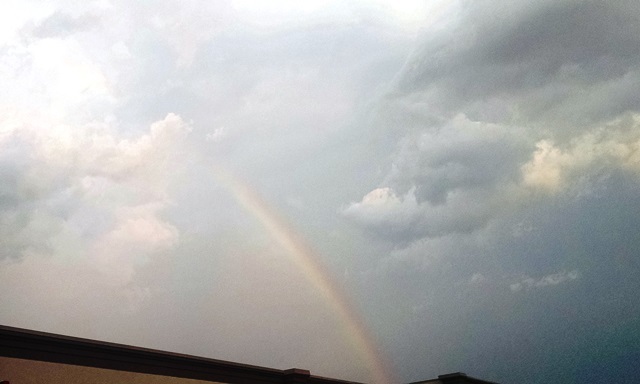 The rain was pretty much over by 9:00 and it was already starting to be muggy. By noon the sun was out and the temperature was rising quickly. Today for the first day since we arrived, we split the team. Hated to do that, but it was the best use of our time and talents. 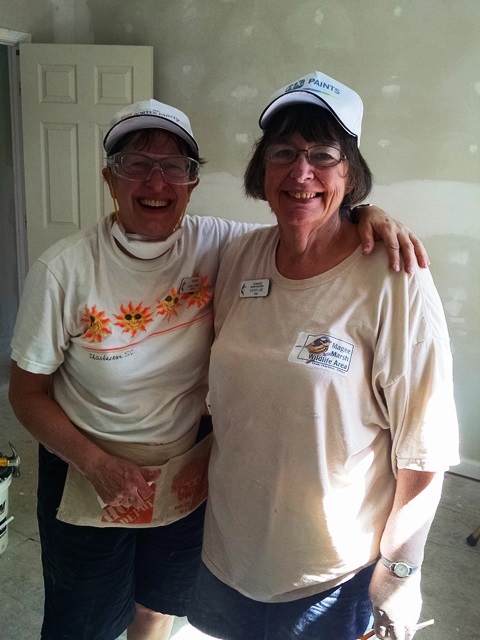 When we first headed to work, Max went with Anne to the NC Disaster Relief warehouse that Anne visited yesterday afternoon and then to the new job site – Leon and Virginia’s house since he had not seen that house. 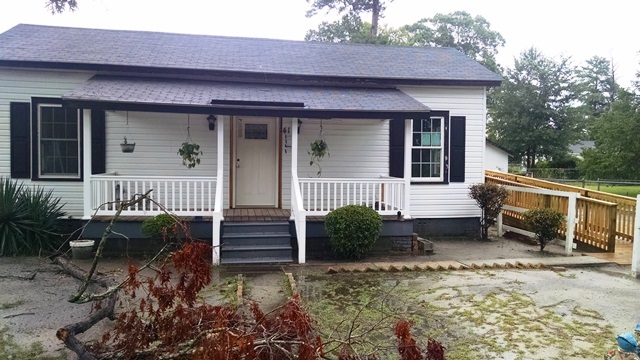 This house is a two bedroom, one bath house and more typical of the homes we work on for disaster rebuilds. We understand that originally all the homes in a several block are were all mill homes, exactly the same floor plan, owned by the company, but then later they we sold to individuals. Currently the plumbing and electrical are not complete. There are only two plugs that are working so we used one for lights and the other for fans. There is no water in the house yet. This entire neighborhood was devastated by the flood and there are not enough licensed people to get all the plumbing and electrical work done. 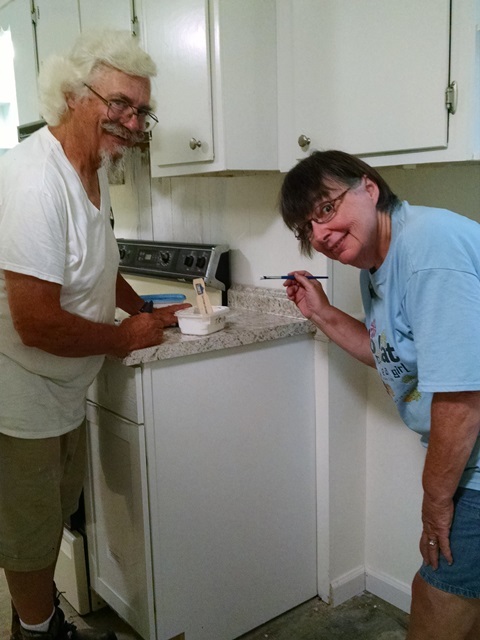 We took the before pictures this morning and then Anne, Ray, Cathy and Larry began the work on the drywall. 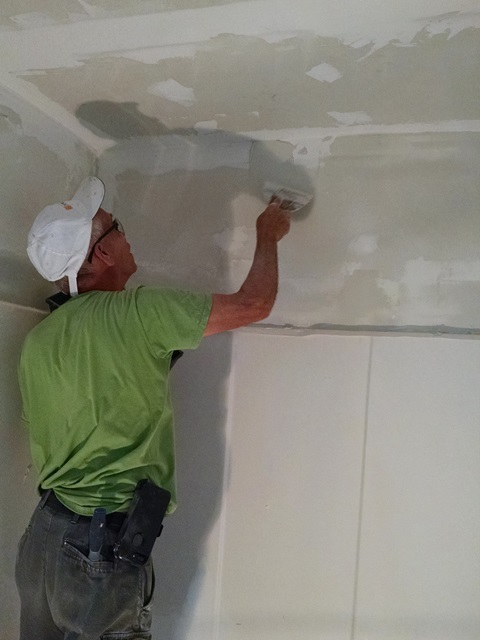 We started on the ceilings which we will stipple a little later. The mudding was started previously but needs a good deal of additional work. The drywall work will take several days. 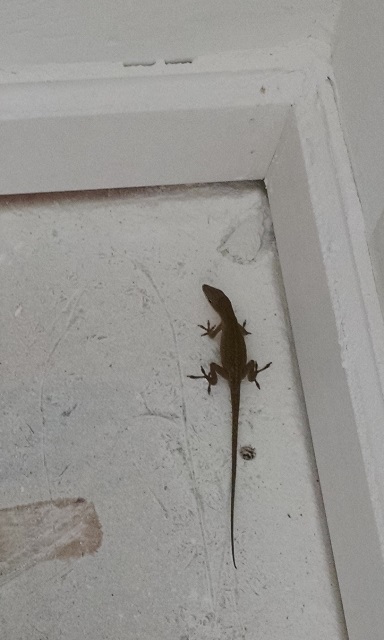 Oh, Leon came over to the new job site this afternoon so we got to meet him. He is an elderly gentleman who seems very nice. He is so anxious to get back in his home. So glad we can help in that process. Maybe his wife will come with him sometime later this week. Max, Suzanne and Carol went back to Mary Elizabeth’s. 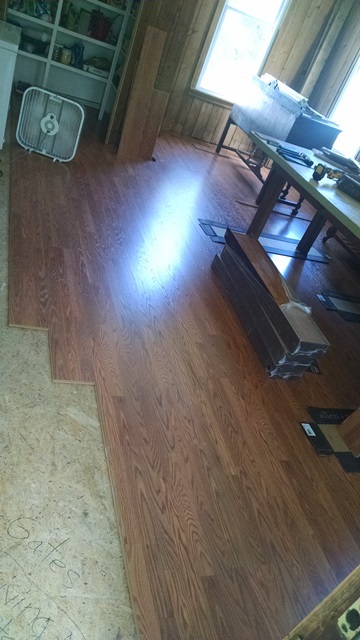 They began the laminate installation in the dining room. There are pantry shelves to work around and shorten as well as another door to be shortened. We all met back at the campground for lunch and then back to more of the same for the afternoon. 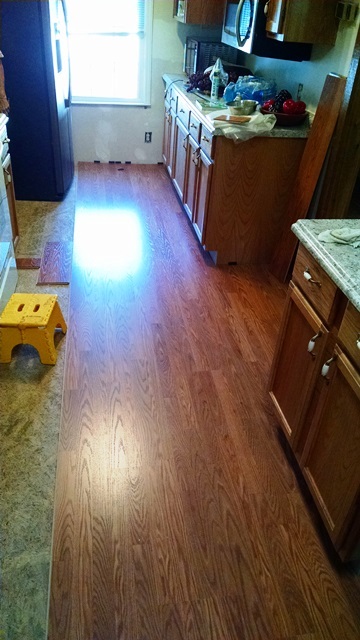 The laminate is now about 75% complete in the dining room and all that’s left is the kitchen. 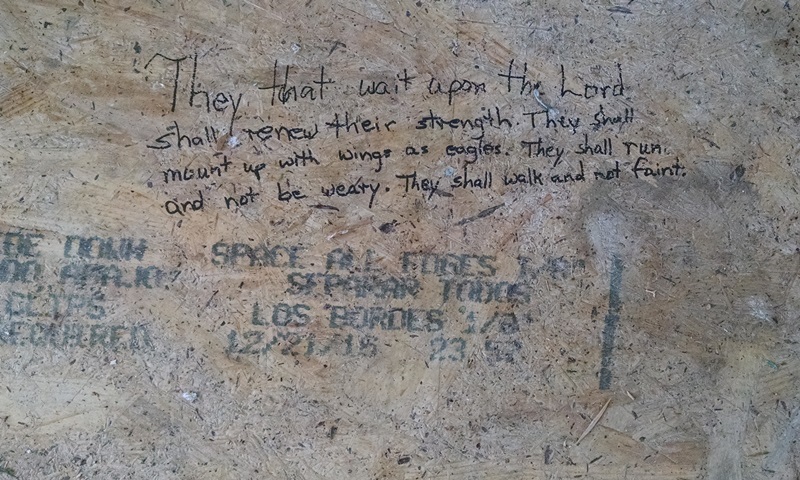 Since all the dry wall was already up when we arrived, we couldn’t write scripture on the studs so we have decided to write on the sub-floor before we place the laminate. 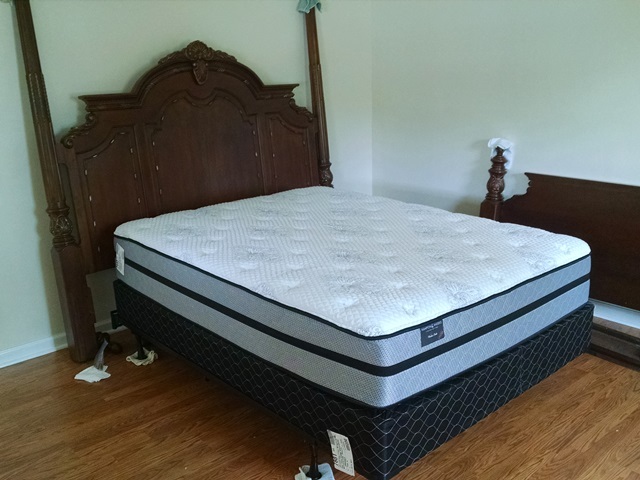 Another good day for Mary Elizabeth and Elizabeth because Elizabeth’s new mattress and box springs were delivered. One more step in their return to normalcy. It was another good day. It rained off and on during the night and was still raining when we got up this morning. By time for everyone to come to our home for devotional time the rain had stopped for the day. We were thankful that it remained cloudy and hoped that meant a cooler day. 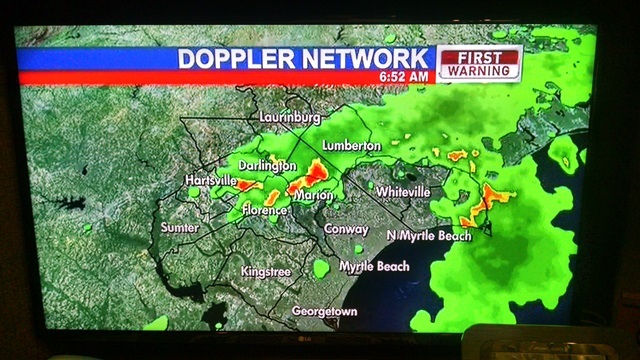 We had a little more drizzle during the early part of our work day, but it was a way cooler morning to work. Wonderful. Since it was Monday and half of our team was new today it was a little slow start, but then we really got moving. 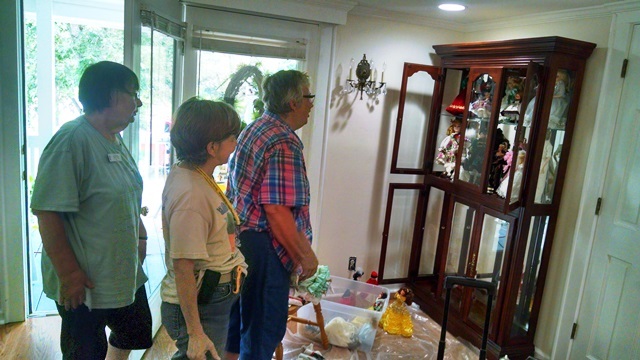 The best thing about today was that we got to assist Mary Elizabeth in moving her curio cabinet back in it’s place in her living room. She then spent the remainder of the day polishing it and then placing her precious dolls back in their home. 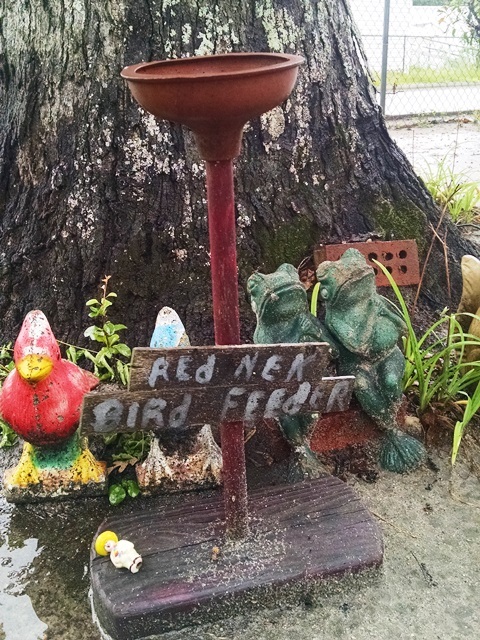 They have been safely packed away since the flood. Mary Elizabeth is just so happy. She is finally feeling that she is getting her home back. It brought tears to our eyes today just to talk with her and watch her. 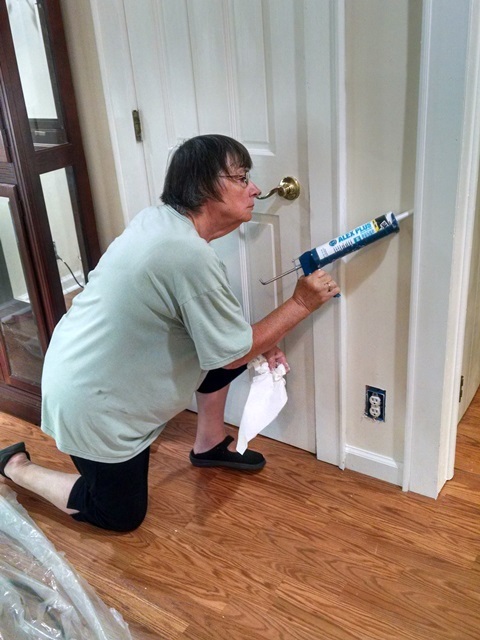 We worked on the caulking and painting of trim in the living room. We also finished the trim around the fireplace and the stairs in the hallway. 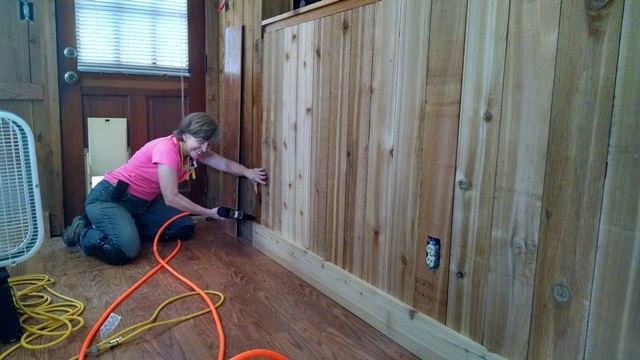 The next big project that was completed today was the re-installation of the cedar boards in the dining room. 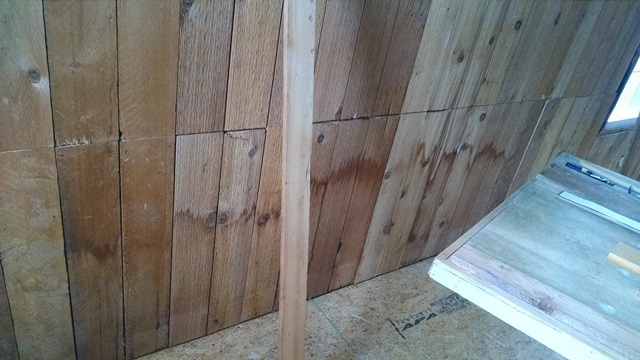 With water up 2.5 feet in the dining room the boards had to be cut and the insulation removed and replaced. 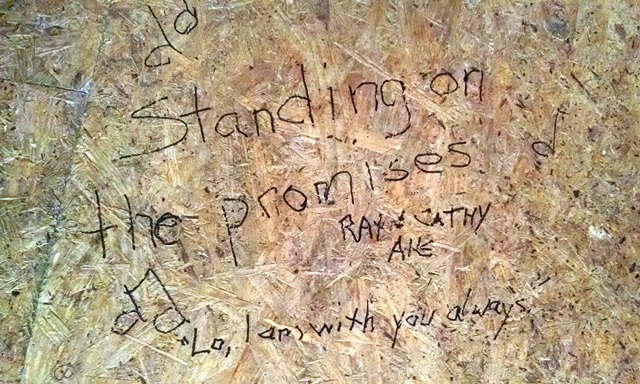 That was done shortly after the flood. 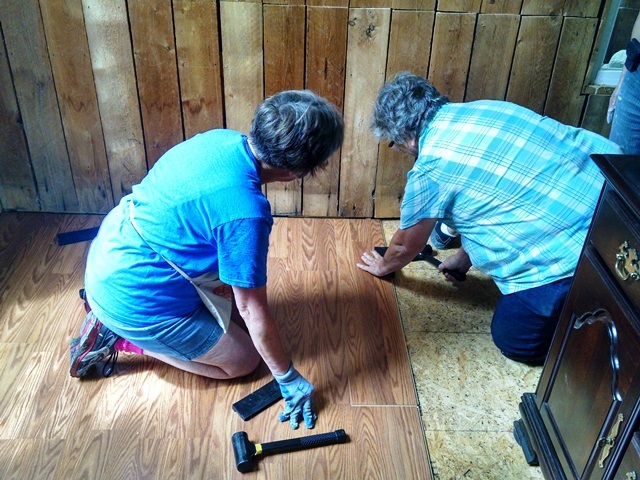 Now we had to put the boards back in place – which was like putting together a jigsaw puzzle. But the re-installation was completed as far as we could get today. We will have to purchase more cedar to complete that job and will then install a cedar chair rail where the boards were cut. Now it’s time to install the laminate in the dinning room which should begin tomorrow. We also went to a new job site this afternoon. It is a much smaller house just maybe 2 miles from Mary Elizabeth’s. The home owners are not living in this home because it had to be completely gutted due to mold. 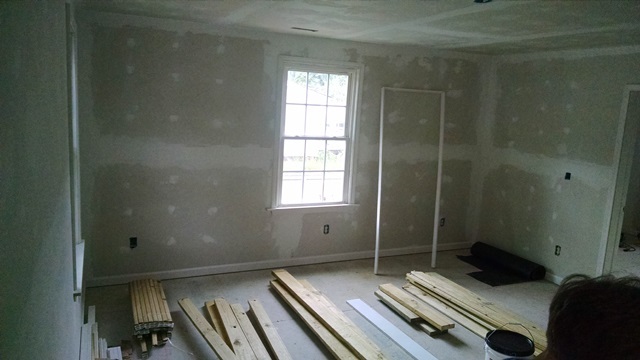 All of that has been removed and the interior walls rebuilt and drywall installed. We will divide the team and part of us will start there tomorrow while the rest will work on the laminate at Mary Elizabeth’s house. This new site will begin with drywall finishing. Sorry, no pictures today of the new site because the phone battery was almost dead but we will get pictures before we start first thing in the morning. That’s about it from Lumberton today. It’s 7:30 and we are waiting for it to cool off some more before we get our afternoon walking done. We understand it is going to be a really hot week at home, too. Y’all stay safe and drink lots of water!